The person who leaked "Rebellion" details strikes again. About a month ago, a Redditor by the name of "derptemp6698" leaked details about the upcoming "Rebellion" DLC for Mass Effect 3. With that legitimacy under his belt, he has since responded with a twofer, teasing details about the "Earth" multiplayer DLC as well as the free "Extended Cut" that BioWare hopes will soothe angry feelings over the ME3 ending. The fighting is fiercest when it's your home at stake! 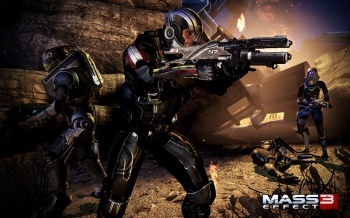 Mass Effect 3: Earth adds mods, gear, and new maps for Rio, Vancouver, and London. It features 3 new weapons: Piranha assault shotgun, Acolyte pistol, and Typhoon light machine gun. Six new human N7 classes are also available: Destroyer, Paladin, Demolisher, Slayer, Shadow, and Fury! There's really no new information there, but the informant says that it's "it's at least done." So hopefully, this is something that ME3 fans can look forward to sooner rather than later.